Our Booth Butler, free props box and quality photos inject a new feature and experience to weddings. 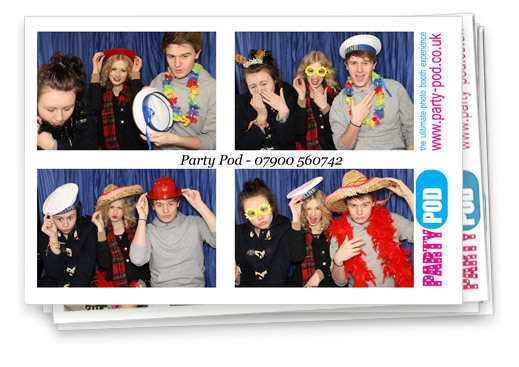 Hailed in America as a must have for weddings – the Party Pod Photo Booth Experience is now available to the UK market. A fantastic idea based on the old passport photo booth but transported into the modern world with a twist! Our photo booths allow 2, 3, 4 and even 5 people to enjoy having their photo taken together using fun props (hats, wigs, glasses, feather boas etc). You have a few seconds between each picture to swap the fun props between each other or reach for more fun props from the prop box. To add further excitement our Booth Butlers encourage you to enjoy the moment and they can personalise the photos so that your names and the date of your wedding, runs across the middle border of each print. Every time your family and friends enter & experience the Party Pod one single print of 4 pictures is produced there & then for your guests to take and keep as a fantastic memento of your BIG day. The Party Pod team work very close with you and your venues wedding co-ordinator to make sure every detail is finalised; positioning, access, timings, power point’s etc. The Party Pod is the ideal addition to any wedding.